One of the homes on Barnett that has been demolitioned. Submitted by Dr. Brock Nolin. 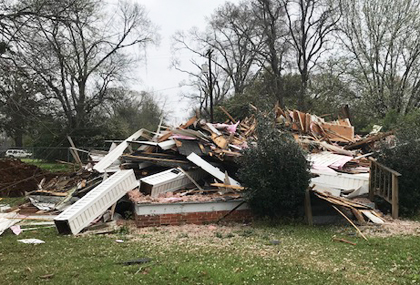 Many longstanding houses along Barnett Boulevard, King Street and Preer Street have come down, as the Tallassee School System makes preparations for changes on the high school campus. "We've taken down four houses. We owned seven in that area," TCS superintendent Wade Shipman said. "It's a process. We have to do an assesment for asbetos. Then we have a company remove (it). Then the demolition can take place." Shipman added that the process can be "costly" from the purchase of properties to the removal of structures. "We're hoping that come April, we're going to do a couple of things. One is that all of the houses will be demolished. The second part is that we're hoping to approve a bid to do some sightwork and start preparing for some parking." The city deeded the school system Preer Street for development adjacent to the high school campus. "We can actually move the street over to give us more room to build on the main campus area," Shipman added. "There will be parking on both sides of that road. There will be parking on the front side and back." A new performing arts center has been proposed for construction on the side of the school where Preer Street is currently. "Really, it's an auditorium. As we are considering all the needs on the campus. If we're looking at eventually taking down the main building, then that auditorium doesn't really fit our campus. It's undersized. We can't put our student body in there. We're looking at the 600-700 capacity range. Whether it's included in a performing arts center or not, there is still going to be a need for an auditorium when that building is replaced." 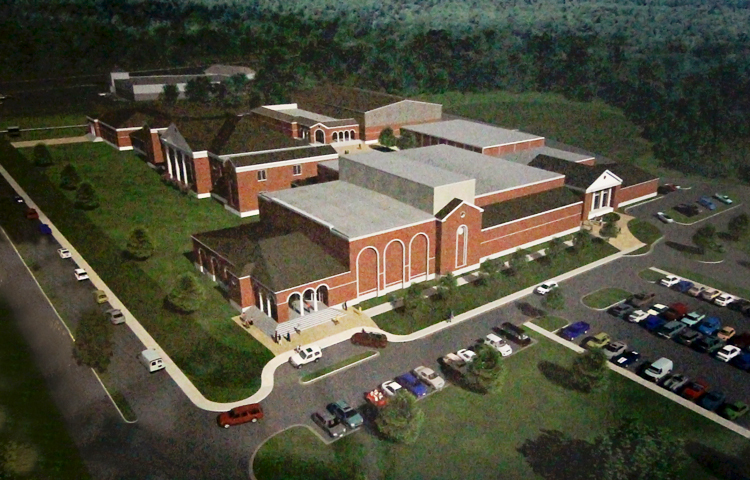 Rendering by McKee & Associates with the performing arts center/auditorium in the foreground.